All election sites in Latvia’s five regions opened on time for 13th Saeima elections, as confirmed by Central Election Commission representative Kristīne Bērziņa. She says there has been no information regarding any complications so far. 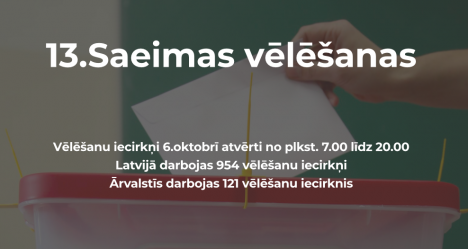 954 election sites all around Latvia opened their doors in the morning of 6 October. They will remain open until 20:00. As reported by CEC, a total of 1,075 election sites will be open for 13th Saeima elections, of which 954 will be open in Latvia and 121 – in foreign countries. Saeima elections have five regions – Riga, Vidzeme, Latgale, Kurzeme and Zemgale. Riga election region also includes sites in foreign countries. There are 100 seats in Latvia’s parliament. The number of elected deputies in each region is dictated by CEC in accordance with the law. 35 deputies are elected in Riga, 25 – in Vidzeme, 14 – in Latgale, 14 in Zemgale and 12 in Kurzeme. 16 political parties and party unions with a total of 1,416 candidates will compete for seats in the parliament in 13th Saeima elections.